Young Voters Day Underscores the Importance of Civic Engagement | The Gettysburgian. 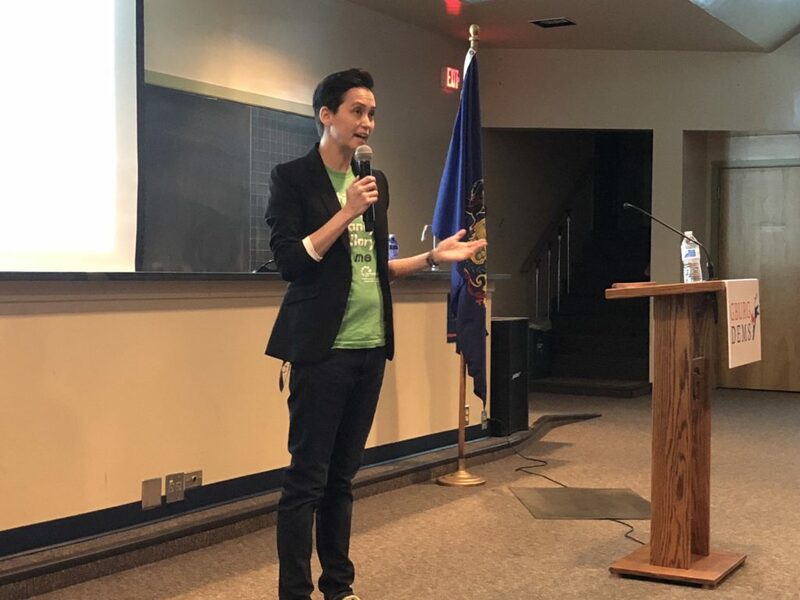 Enhanced security measures were in place Saturday afternoon at Masters Hall as students gathered to hear from Democratic officials as part of College Democrats’ first annual Young Voters Day on Saturday from 12:00 p.m. to 3:00 p.m. The Department of Public Safety was present both inside and outside the building, and persons attending the event were subject to a bag search. A DPS officer said that the enhanced security measures were not in response to any specific threat, but were instead implemented out of an abundance of caution. Lieutenant Governor Candidate John Fetterman, Mayor of Braddock, Pennsylvania, Former Director of NARAL Pro-Choice America Kate Michelman, who spoke at Gettysburg in the fall, and Executive Director of Emerge PA Anne Wakabayashi headlined the event, which also featured several local candidates including Adams County Commissioner Marty Qually, who is a candidate for the 91st district of the Pennsylvania House of Representatives. Video messages from Pennsylvania Governor Tom Wolf and Senator Bob Casey welcomed attendees and thanked them for being engaged in the political process. “Your generation has already inspired people all over the country, in terms of your leadership and in terms of your passion, and I have no doubt that your generation will bring more justice to our country…but we need you to register to vote,” Casey said. 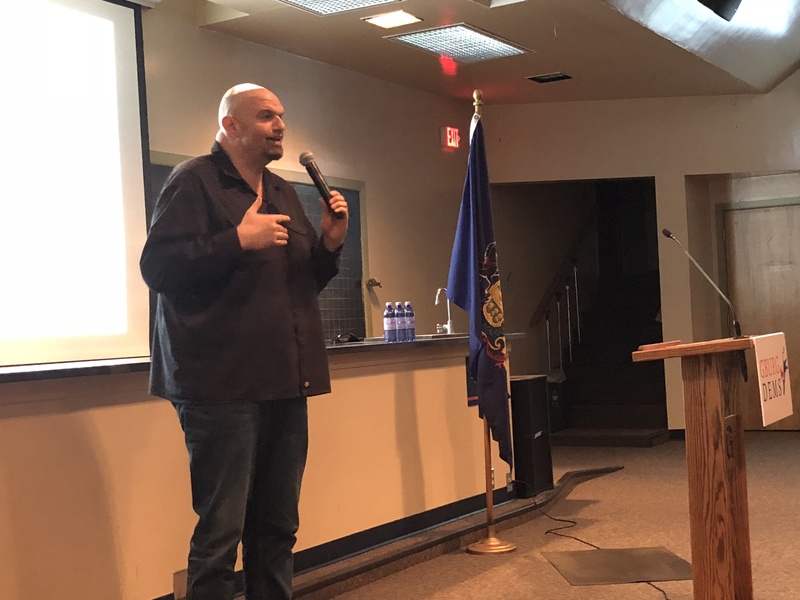 Fetterman, who won his first mayoral election by just one vote and who the College Democrats voted to endorse this week, stressed the importance of civic engagement among young people and said that it is essential that everyone get out and vote. Fetterman also urged people to be pragmatic when choosing whether or not to vote. He used the example of Conor Lamb, who ran as a centrist and won the special election in Pennsylvania’s 18th District last month by a very narrow margin. “We were very much involved with some push back with some folks that were critical of Conor based on some of his positions. And I would say, ‘Look, I don’t agree with those positions either. But I would rather take someone who is going to vote with me eight or nine out of ten times than someone who is going to vote with me zero out of ten times.’ I’m a proud, unapologetic progressive, but I also don’t want pragmatism to ever become a dirty word or a concept that I’m willing to run away from,” Fetterman said. Fetterman concluded by saying that this election is the most important one in a long time, and that it is critical that voters turnout to ensure that seats flip to the Democrats. “I’m hopeful there’s a blue wave, I hope it’s a blue tsunami. I hope it carries us all the way to Blueville,” he said. Wakabayashi asserted that it is important to increase the number of women, people of color and LGBTQ people who hold state political office. “The problem that I have with the Democratic party in general, is we want to run these centrist candidates–and it’s almost always white dudes–but, we want to run these centrist candidates and we want to be, like, the future of our party is in, kind of, how close can we get to the Republicans without being the Republicans as possible so that we can win some of those seats. And that’s just kind of bulls–t,” Wakabayashi said. Wakabayashi said that Democrats need to go back to their base and pick candidates from the communities that vote Democratic. “At the end of the day, what we need to do is we need to go back to our base. We need to go back to the communities that come out for us all the time, and we need to run candidates that look like the communities that vote for Democrats. If we run Republican Lite, nobody–like, if you want to vote Republican, you’re not going to vote for a Democrat that kind of votes like a Republican… you’re going to vote for a Republican. It’s how we keep losing races,” she said. Wakabayashi said that the solution is to put more people of color on the ballot. “What we need to do is–in my personal opinion–run more people of color, run more black women. Black women are the backbone of our party, and the fact that we don’t run more, or basically all black women–just basically full slates of black women everywhere– is absolutely ridiculous…they come out to vote and they bring everyone with them out to vote,” she said. The event also featured remarks from members of Gettysburg College Democrats and their co-sponsoring organizations including Democracy Matters, Students Against Sexual Assault and Gettysburg Outerspace. About 50 people were in attendance at the event. Brendan Salyards ’20, a member of College Democrats’ executive board, said that he was satisfied with the turnout at the event, especially considering the various other events and athletic contests around campus that were scheduled concurrently. Salyards added that they’ve registered people to vote in connection with this event, and that is a success in and of itself. “This is the start of our operations for the year, and I definitely think that, in the fall, with the new first-year class coming in, we’ll be able to get people on the rolls, and we’re working with the college to make sure that the polling place is in CUB 126, where it was in the past..so I’m confident that we’ll see an uptick in voter registration,” Salyards said. Salyards said that events like these are important to promote voter turnout and civic engagement. “It’s incredibly important that people go out and vote, and participate in the process. You can’t expect to be represented if you’re not making your voice heard. And, it’s important that students start at an early age…and make a habit of voting. We’re happy that we can do that for anyone at the college,” he commented. 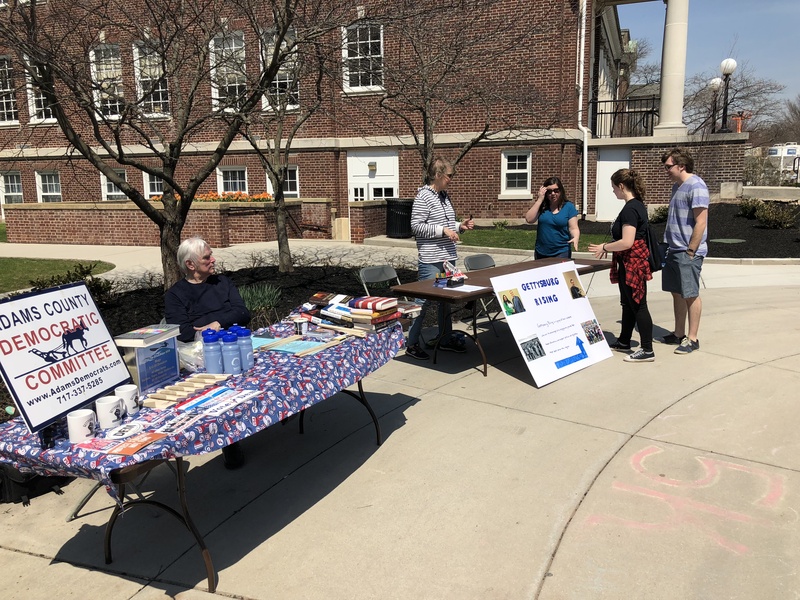 Salyards added that College Democrats hopes to hold more events like Young Voters Day in the future that bring speakers and candidates to campus. “This is the first time we’ve had Young Voters Day, we’ll see if we do it again next year, and maybe we can get some more people out,” he said.